It measures 3.4cm x 3.4cm and is made of two layers of glass. 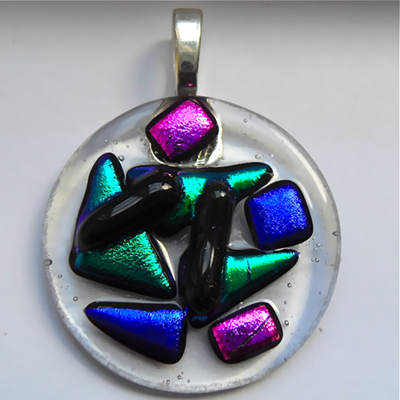 A clear glass base with a layer made of pieces of Emerald Green, Cobalt Blue and Magenta Dichroic glass, finished off with two pieces of Black glass. It comes with a 16" x 1mm Sterling Silver snake chain in a Black or silver card gift box.